Click here to view a PDF copy of the AGP Technical Guide. Cycling BC, Bicicletta, and all of our sponsors and partners, are proud to present the BC Provincial Criterium Championship. This single day criterium event will be held on July 28, 2018 at Jonathan Rogers Park, Vancouver, BC. The course will be held on a fully closed and secured 800m circuit. There is a mix of fast fast sweeping down hill corners with a mix of challenging uphill climbs for the back half of the course and solid burn to the finish with plenty of room for attacks and moves from the pack. Race timing will use EV chip system, with chips mounted on the bike. Please bring your Spring Series/WTNC chip if you have one. There will be a $5 chip fee for new chips. Results will be posted on the results board following each race. There will be a 15 minute time period for a claim to results. Registration requires the presentation of a valid CC/UCI or Cycling BC citizen license to be considered final. Sign-on and number pickup will close 30 minutes prior to the start of all races. In the event of unsafe weather (e.g., lightning or high wind) on race day, race officials may delay or cancel racing. Results will be posted at the Results Boards near the Registration area following each event. Awards ceremonies for each wave of racers will be held at the noted times in the race schedule. All podium finishers are expected to be in attendance. The BC Provincial Criterium Championships will take place on date and time as scheduled. There will be no extension of the Championships past Saturday, July 28 due to unforeseen delays or prolonged stoppages. In case of stoppages, priority will be given to "championships" class. Racing format may also be modified at the discretion of the President of the Commissaires Panel in response to prolonged stoppages. The event(s) will be run under Cycling BC/Cycling Canada/UCI rules. All racers must have a valid Cycling BC license. Categories with fewer than 4 starters may be merged with another age or ability category at the discretion of the Technical Delegate or President of the Commissaires Panel for the start, but will receive awards separately. Equipment regulations to be enforced for ALL championship categories. There will be NO exceptions. Approved helmets are mandatory for training, competition and anytime you are on a bike. The BC Criterium Championships are open to BC residents who hold a valid Cycling BC race license. Any resident of BC, regardless of citizenship status is eligible to win the​ Provincial title and Provincial Championship podium positions and medals. Should a non-citizen (permanent resident, landed immigrant or individual with refugee status) place amongst the top three overall finishers in the race category, a podium presentation will take place based on order of finish of the race and a second podium presentation based on the Provincial Championships results of eligible BC citizens will follow. All athletes must be in possession of a valid UCI or BC Provincial race license. Domestic licenses from other countries or within Canada are not permitted for Championship categories. No one day event licenses will not be eligible to race. Race day registration will be available until 30 min prior to race start.. The categories are defined as per UCI rules based on year of birth. Your racing age for the Championship is the age you would be on Dec. 31, 2018. The event(s) will be run under CC/UCI rules. All riders must know the rules. The BC Championships shall be governed by Cycling BC. Equipment regulations, as per UCI Rules, to be enforced for ALL senior categories. There will be NO exceptions. Call ups for all categories will be based on the first 8 spots will be based on the results from the previous years BC Provincial Championship results. When multiple categories are starting at the same time. Results will be posted separately. Warming up on the course while a race is in progress, or at any other unauthorized time, is strictly prohibited and will result in disqualification. Please respect the other racers by not warming up immediately behind the last place rider in the ongoing race. Helmets must be worn AT ALL TIMES when riding the course & failure to comply will result in disqualification. One large pit is located in the finish straight 100m prior to the finish line. Only riders and riders’ mechanics/assistants may be present inside the Pit Area during the race. Please remove your equipment out of the pit area immediately following your race. Riders are required to wear club or team jerseys corresponding to their license. Independent riders are required to wear a jersey with no significant logos, team names or advertising displayed on them. Sleeveless jerseys are not permitted. The use of glass containers is strictly prohibited. Race numbers and timing chips will be distributed at registration. Please use your current Escape Velocity Spring Series/Tuesday Night timing chip if you have one. Chip placement will be on the seat post. Numbers must not be folded or modified and must clearly show all advertising. Numbers must be completely visible at all times during the race.. Number placement will be displayed at sign-on. A Provincial Champion jersey will only be awarded to Provincial Championships Title categories. All athletes who have placed on the podium must attend the awards ceremonies. Failure to do so will result in a fine and loss of award (including prize money). Riders who cannot attend the awards ceremony must advise the President of the Commissaires Panel or the Technical Delegate with a valid reason. Reasons such as, “I have a ferry to catch” will not be accepted. Riders must wear cycling apparel to the awards ceremony. Failure to do so will result in a fine and loss of award (including prize money). As per UCI rule 9.1.046, riders shall appear on the podium in racing attire, wearing their Provincial jerseys, riders are able to wear a hat or sunglasses but not as such to cover one's eyes until they leave the official ceremony enclosure. Failure to do so will result in a fine and loss of award (including prize money). 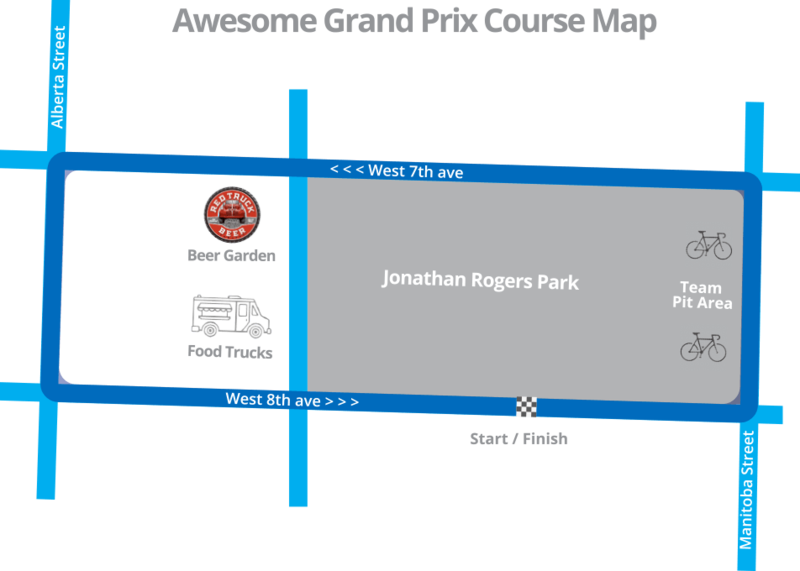 Team Tent area is available on the field of Jonathan Rogers Park nearby the Registration and See course map, above. Washrooms are available at the corner of 7th Ave and Columbia St.. There is ample free street parking in the streets North of the event, there is also a large parking lot on the corner of 4th and Columbia. A team of trained medical staff will be in place during the event, with primary location near the Registration / Team Tent area. The area is served by 911 service.